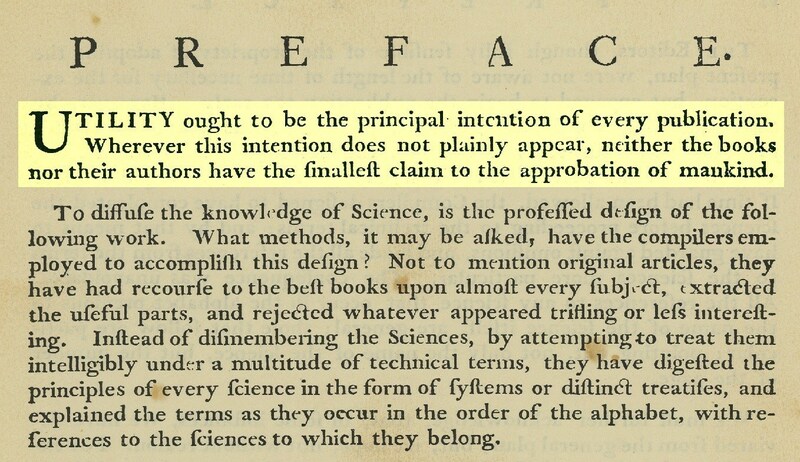 The preface to the first edition of the Encyclopaedia Britannica. Iconic global brand has adapted to changes in consumer behavior, medium, and business model shifts by embracing change, breaking boundaries, and exhibiting organizational learning agility. CHICAGO, December 6, 2018—Encyclopaedia Britannica will celebrate 250 years of continuous operation on Monday, December 10. Britannica’s two-and-a-half-century journey began in 1768 on an out-of-the-way street in Edinburgh, Scotland, when the encyclopedia’s founding publishers, engraver Andrew Bell and printer Colin Macfarquhar, hired scholar William Smellie to be Britannica’s first editor. They tasked him with producing a practical, English-language reference work founded on the principle of “Utility,” the goal being making knowledge available to the masses in a world where Latin was the language of intellectuals. Long known for multivolume print encyclopedias, Britannica has, for the past four decades, been a leader in digital media, publishing the first digital encyclopedia in 1981, the first multimedia encyclopedia in 1989 (four years before Microsoft Encarta), and the first encyclopedia on the Internet. The company’s publications have been primarily digital since the 1990s. Its iconic print set ceased publication in 2012. “The medium in which we operate may change, but our commitment to UTILITY remains steadfast and unwavering,” said Krishnan.